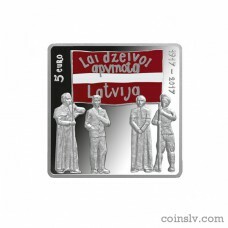 Latvia 5 euro 2017 "Latgale Congress"
Obverse: The obverse shows the representatives of various strata of society – participants of the Latgale Congress of Latvians, carrying a red-white-red poster calling for the unification of Latvia. The inscriptions "5 euro" and "1917–2017" are placed on the top left and right respectively. 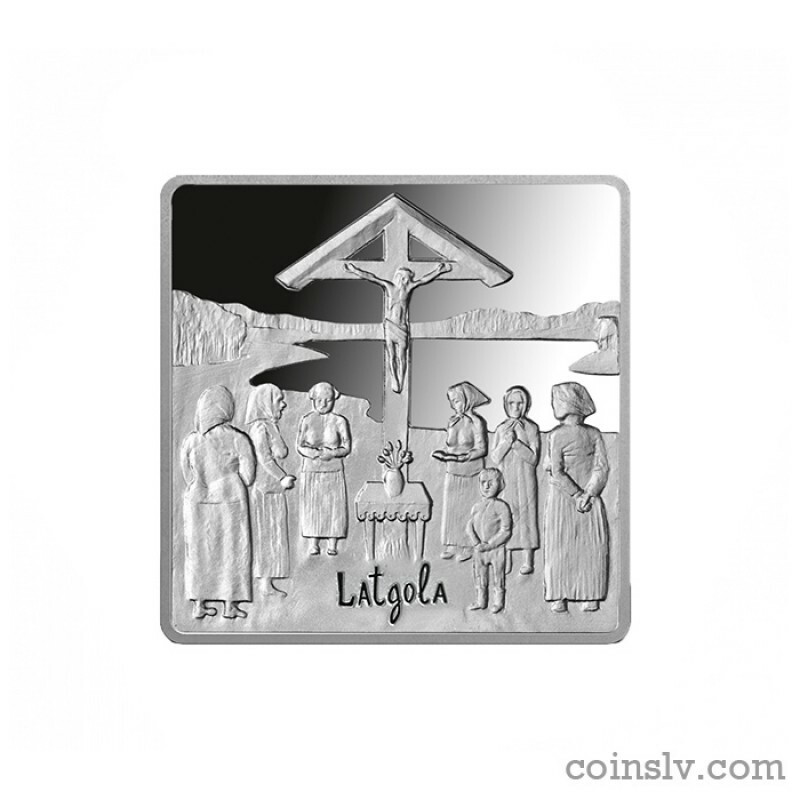 Reverse: The reverse features women with children standing at the crucifix; the inscription "Latgola" is placed at the bottom. The Latgale Congress of Latvians took place on 9–10 May 1917 (26–27 April, old style) in Rēzekne. Delegates from Latgale municipality and town governments, parishes and societies as well as Latvian riflemen participated. The Latvians of Latgale had been separated from their countrymen in Vidzeme and Kurzeme for almost 300 years (1629–1917), first under the Poles and, since 1772, as part of Russia. The basic question to be decided by the Congress was: what path should Latgale take? Should it unite with Kurzeme and Vidzeme or try to establish its own autonomy? The Catholic priest Francis Trasuns (1864–1926) and his followers represented the former view and the engineer Francis Kemps (1876–1952) supported the latter. On the morning of 26 April, thousands of Latgalian Latvians and representatives of other ethnic groups marched side by side with the Congressional delegates from the Rēzekne Trade School to the Catholic Church (present-day cathedral). It was at the church that the Latvian anthem "God, Bless Latvia!" was sung publicly for the first time. The Congress began its proceedings in a meaningful location, the cinema "Diāna" (it has not survived) festooned with flowers and greenery. Diana was the Roman goddess of fertility and hunting, usually depicted with a crescent moon above her head and a bow and arrows in her hands. Romans considered that those who managed to find refuge in Diana's temple were untouchable and in safety. During the Congress, the building where it passed was surrounded by a crowd of both supporters and opponents of unification. The building was guarded by about 40 riflemen from the Latvian Riflemen Reserve Regiment under podporuchik Jānis Rubulis (1893–1960). The Congress was attended by voting delegates and guests. Zigfrīds Anna Meierovics (1887–1925), who later became the first foreign minister of Latvia, had arrived to congratulate the Congress. In his speech, he pointed out that Latvians of all regions were the sons and daughters of one and the same mother. The delegates who were against unification expressed their attitude by getting up and leaving the proceedings. The first half of the resolution adopted by the Congress was a declaration that expressed the wish of Latgalians to unite with the Latvians of Kurzeme and Vidzeme while retaining their local government and the right of self-determination on issues concerning language, faith, church, school and economy, whereas the second half provided for specific measures to attain these goals. The Provisional Land Council of Latgale was elected, and the proceedings ended with "God, Bless Latvia!" accompanied by an orchestra. Thus in 1917, the Latgalians made their fundamental choice to unite with their fellow Latvians in Kurzeme and Vidzeme, and the budding Latvian state was formed, according to the administrative division of the time, of Vidzeme, Kurzeme and Latgale, cultural and historical regions represented today by the three stars in the coat of arms of the Republic of Latvia. 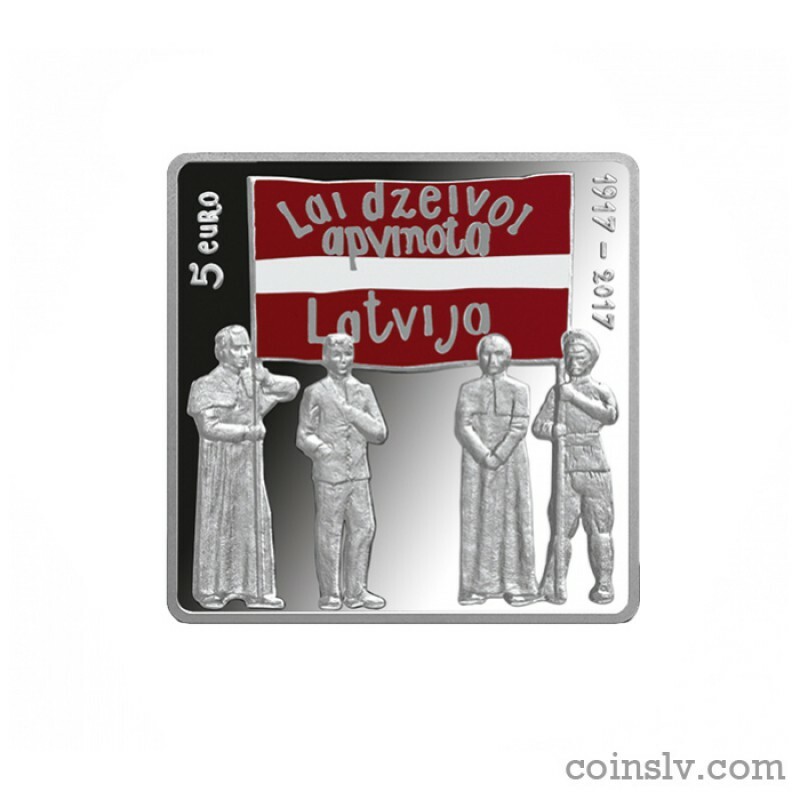 Latvijas Banka expresses its appreciation of Latgale for its contribution to the idea of the unity and sovereignty of Latvia by issuing a silver collector coin dedicated to the Latgale Congress of Latvians. The images depicted on the obverse of the coin symbolise the main driving force behind the Congress: Catholic priests, riflemen, teachers and public figures. The inscription on the red-white-red slogan is borrowed from a historical photograph and, reflecting the yet to stabilise written Latgalian, expresses the fundamental idea behind the Congress. The reverse of the coin features the crucifix with women and children gathering around it for the May singing. The May outdoor singing as a folk tradition characteristic of Latgale has been included in the Latvian Cultural Canon.